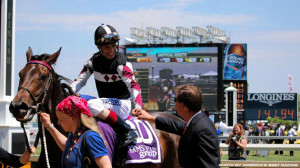 After a noble 4th place finish overseas at Royal Ascot in the Coronation Stakes, Sagamore Racing, Allen Rosenblum and The Club Racing LLC’s Miss Temple City is returning to the U.S. to run in the $300,000 Grade 2 Maker’s Mark Lake Placid Stakes at Saratoga Race Course on Friday, August 14. 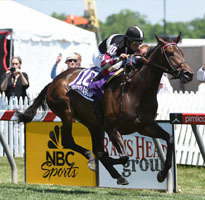 Finishing just two lengths behind Europe’s best fillies on June 19, the three-year-old filly by Temple City, out of Glittering Tax, by Artax, is looking to bounce back and secure her first victory since winning the Hilltop Stakes on Black-Eyed Susan Day at Pimlico Racecourse. Under Hall of Fame Jockey John Velasquez, Miss Temple City will go the 1 1/8-mile turf track in the No. 3 post, battling alongside graded stakes winners Consumer Credit and Strict Compliance. To date, Miss Temple City posts a 6-3-1-1 career record with $172,799 in earnings.